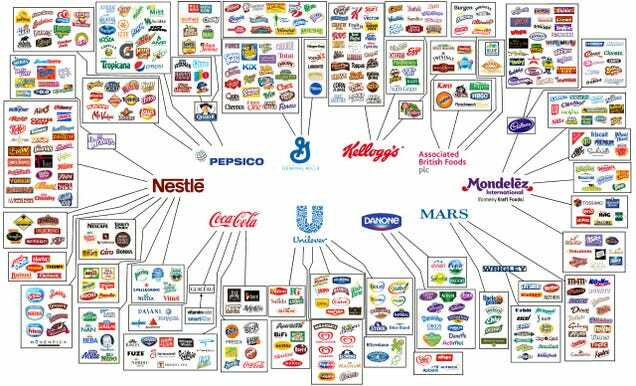 All the biggest product brands in the world are owned by a handful of corporation. Food, cleaning products, banks, airlines, cars, media companies… everything is in the hands of these megacorporations. These graphics show how everything is connected. In the supermarket—as you can see in the graphic at the top—Mondelez, Kraft, Coca-Cola, Nestlé, Pepsico, P&G, Johnson&Johnson, Mars, Danone, General Mills, Kellogg’s, and Unilever own everything. Continue to look at other “maps” that they are showing on their site.